Harold Simmonds was born on Christmas Day 1921 in Burgess Hill, Sussex. He went to London Road School and later worked in a government job. 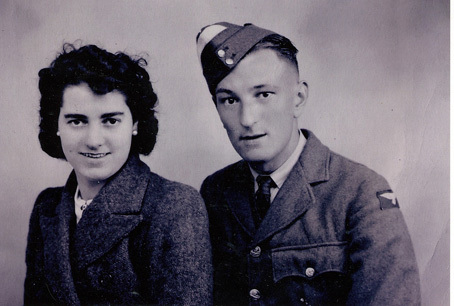 Soon after the war started, Simmonds volunteered for the RAF. He started his service in groundcrew, serving at Kemble in Gloucestershire and Mount Batten near Plymouth. However, he had always wanted to ﬂy, and eventually he was selected for aircrew training, going to the No.2 Air Gunners School in Dalcross, near Inverness. He then met Vivian Nicholson, John Fort and Antony Stone at 1660 Conversion Unit at Swinderby, when they were all posted there on 5 January 1943. He went with them to 1660 Conversion Unit, and on to 207 Squadron, finally ending up at 97 Squadron, where the whole crew joined up with David Maltby. Four months after the raid, on 14 September 1943, Simmonds took off from RAF Coningsby on 617 Squadron’s first major operation since the Dams Raid. When their aircraft suffered its final crash it sank with the bodies of all the crew except the pilot, so he has no known grave. Harold Simmonds is commemorated on the Runnymede Memorial. We always hoped we could find some relationship to our family as the spelling is peculiar but no way to tell without further research which I am working on.